/Box office & Day of event /How do I control who pays fees through the box office? You can control who pays fees from the Settings page in the box office. 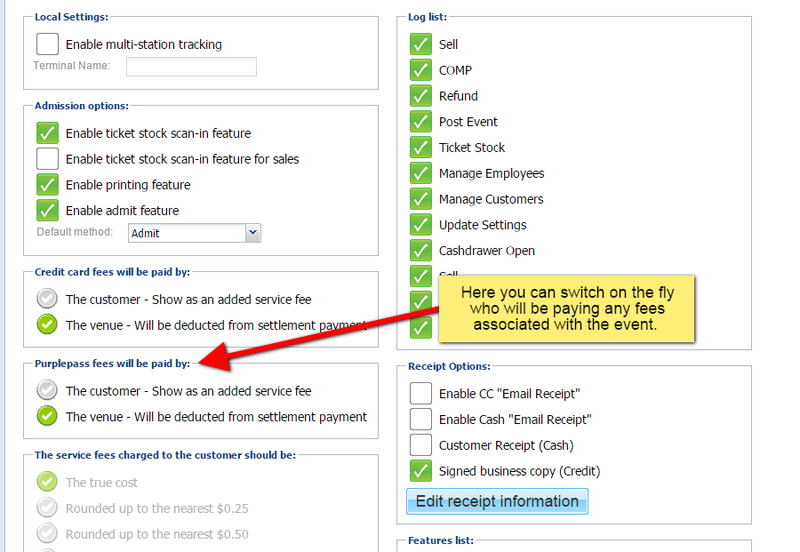 If you’re already on the box office page for your event then the settings button will be in the upper right corner. Click on this and it will bring you to all the box office settings. Here you will see two sections, one titled “Credit card fees will be paid by:” and “Purplepass fees will be paid by:” You can toggle either one of these to whichever you wish. By default, Purplepass does not charge service fees for any tickets sold at the box office unless previously arranged. Credit card fees will always be charged to either the event organizer by default but you may pass it to the customer if you wish.